Thank you for reading the third installment of our series, “Fall Pest Guide”. In the past few weeks, you have been introduced to a wide array of pests that commonly become a nuisance to humans during the fall months. These include spiders, mice, and stink bugs. This week, we are going to cover crickets. As children reenter school, the leaves start their transition from green to various hues of reds, purples, and golds, the distinct sound of crickets chirping in the air indicates that the end of the summer is official and fall is here. More importantly, this is the season when crickets become adults and develop their wings. Crickets are medium to large insects. They are related to the grasshopper and the katydids. Their mouths contain chewing components and the back legs of their body are bigger and much stronger than the other two pairs of legs. Their head is rounded and they possess long and relatively thin antennae. The wings on the adult cricket bend down on either side of their body. 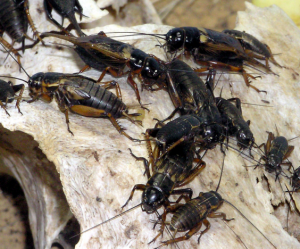 Most crickets are either brown or black in color. There are several that are green in color. There are a total of 120 different species of crickets in the United States. Crickets are not dangerous insects. In some instances, the insects will become a pest in an agricultural setting, but, this is not very common. If they do become a pest, it is because of the fact that they start eating the seeds or consuming crops that are growing. In some cases, crickets may accidentally enter a person’s home. Many believe that crickets are a sign of good luck and will not harm the creatures; however, if a cricket starts damaging seeds and crops or enters the home and attempts to mate by making loud chirping sounds, the people around the insect may become troubled.